2711 ENT FRANCE (1890) Watches. Jewelry. Goldsmith. Pharmacy. Glazier. Trains. Cycles. Autos. Electricity. Chimes. Telephones. Uniforms. 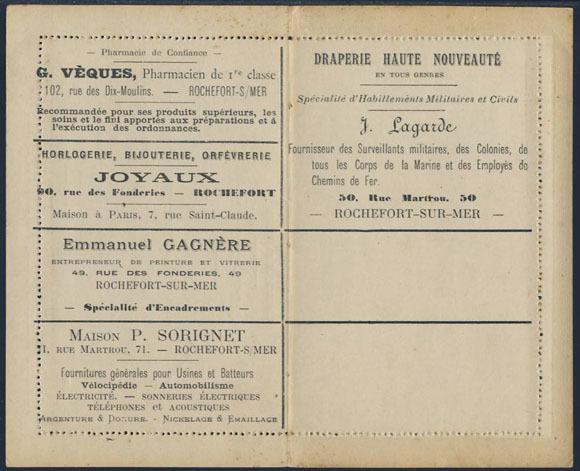 15 centime letter-card "Rochefort" 7th edition, with multiple advertisements. Much scarcer than "La Missive type - not all ads sold. 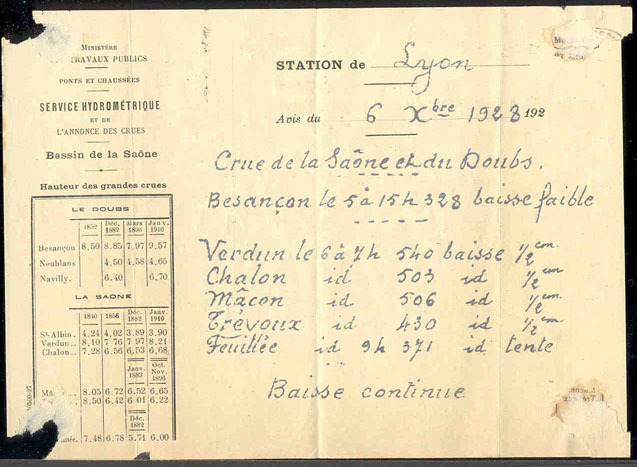 Note typo ""dessein"" instead of ""dessin"" on back page!"" 9406 ENT FRANCE (1934) Typewriter*. 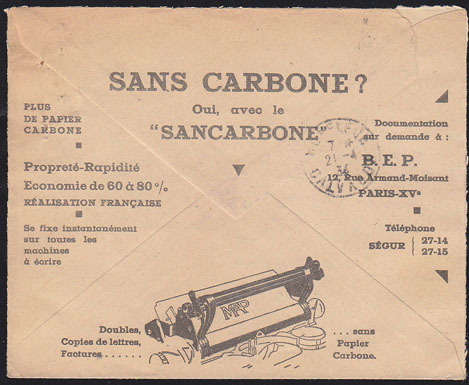 PTT letter (Cheques Postales) with illustrated ad on reverse for Carbonless copying attachment..
9407 ENT FRANCE (1934) Carbon paper*. 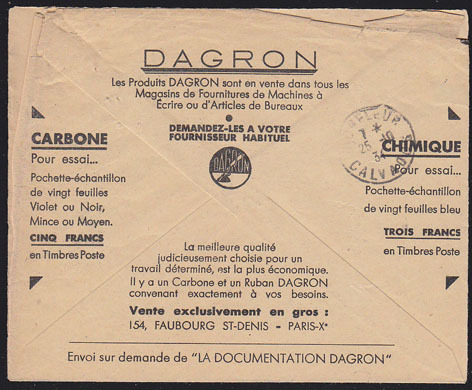 PTT letter (Cheques Postales) with ad on reverse for DAGRON. 9957 ENT FRANCE (1936) Homme en costume*. 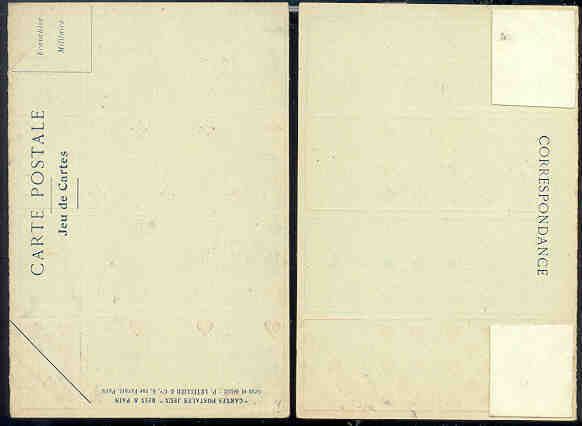 Enveloppe CCP (O) avec publicités multiples dont "R. Baluzzi, ma�tre-tailleur." 10364 ENT FRANCE (1936) Hands performing various cleaning chores: waxing automobile, cleaning milking machine*, bathtub*, kitchen* and laundry*. 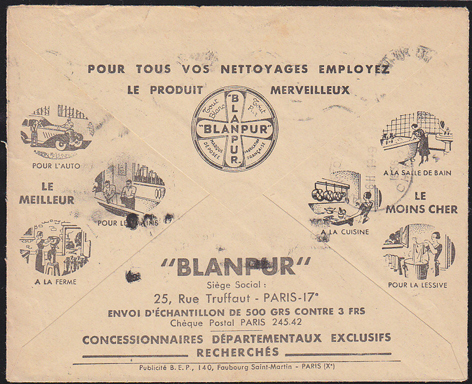 CCP (Postal checks) free frank envelope (O) with outstanding illustrated advertising for "Blanpur" cleaner. 10599 ENT FRANCE (1936) Electric and mechanical calculators*. Typewriter*. 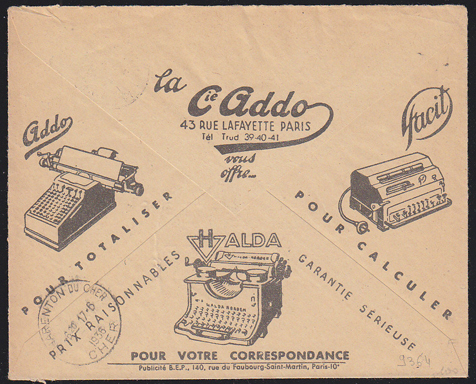 CCP (Postal checks) free frank envelope (O) with superb advertising for the "Addo" adding machines and typewriters. 9959 ENT FRANCE (1937) Men in leather jackets*. 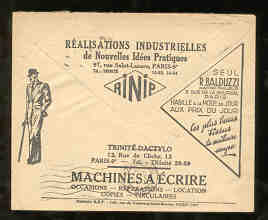 PTT letter (Cheques Postales) with illustrated ad on reverse for Sporting clothes. 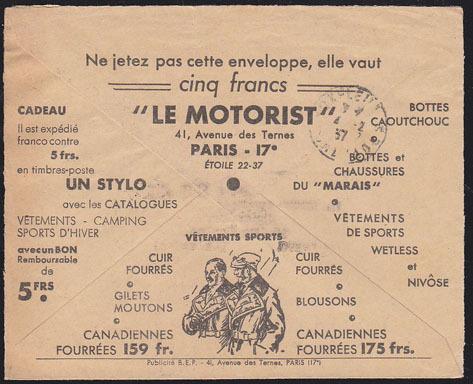 "Le Motorist." 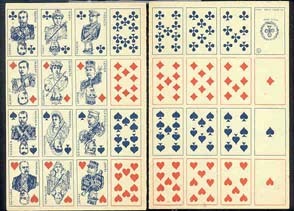 9042 ENT FRANCE (1967) Liqueurs. Black rum, Bordeaux. 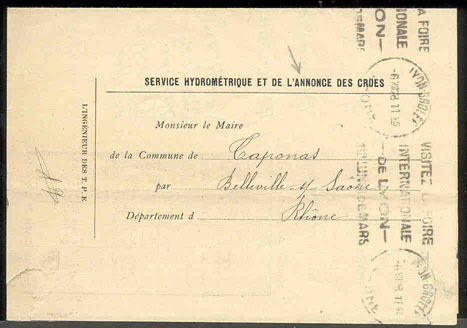 Red meter cancelation on envelope, No N 1763 "CAZANOVE."